Receiving good words at her burial. Saint Nonna of Nazianzus, known for piety, purity and deep Christian faith, was the wife of Gregory of Nazianzus the Elder (Jan. 1). A member of the Hypsistarians, a distinct Jewish-pagan sect worshiping Hypsistos, the "Most High" God, Gregory was convinced to convert to Christianity by his wife Nonna in 325, who would pray for him daily. Both Gregory and Nonna came from wealthy families, and Gregory was able to personally finance the construction of a church in the region of Cappadocia. In 328, Gregory was selected as bishop of Nazianzus, a position he held until his death. Three children were born to Gregory and Nonna, all of whom are saints of the Church. One daughter, Saint Gorgonia (Feb. 23), was outlived by her parents by only a year, and was lauded in the eulogy given by her brother Gregory as a model Christian wife. Their younger son, Caesarius of Nazianzus (Mar. 9), studied in Caesarea Mazaca and at Alexandria and became a physician. He served in Constantinople as the court physician for both Constantius II and Julian the Apostate, and died in 368. Their elder son, also named Gregory (Jan. 25), served alongside his father first as a priest, and then as co-adjutor. Gregory of Nazianzus the Younger would later become the Patriarch of Constantinople and ranked among the great Three Hierarchs of the Church (Jan. 30) and an esteemed Theologian. Nonna outlived her husband and two of her children, dying in 374. "What time or place for prayer escaped her? This was the first thought of her day. Rather, who had more confidence in gaining a petition as soon as it was made? Who had such reverence for the hands and countenance of priests? Who showed such honor for every form of philosophy? Who subdued her flesh more by fastings and watchings, or stood like a pillar during the night-long or daily singing of the psalms? Who had greater admiration for virginity, although she herself was under the bond of matrimony? Who was a better champion of widows and orphans? Who relieved to a like degree the misfortunes of the distressed? These things, small perhaps, and, it may be, even despised by some because they do not lie within the reach of the majority for the unattainable, out of envy, is generally considered as not even credible I esteem highly, for they were the inventions of her faith and undertakings of her spiritual fervor. So, too, her voice was never heard in the sacred assemblies or places, except when necessary and required by the liturgy. It was once counted a glory for the altar that no axe had been lifted upon it, no stone-cutter's tool seen or heard, with the higher meaning that whatever was consecrated to God should be natural and free from artifice. Why should it not redound to her great praise that she honored the sanctuary by her silence, that she never turned her back upon the holy table, nor spat upon the hallowed pavement, that she never grasped the hand or kissed the lips of any pagan woman, however honorable in other respects and however closely related? She would not even share salt, either willingly or perforce, with those coming from a profane and unhallowed table, nor suffer herself, contrary to the law of conscience, to pass by or look upon a polluted house. 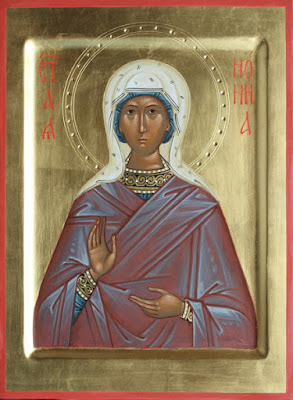 She would not let her ears or her tongue, which had received anh uttered holy things, be defiled by pagan tales or theatrical songs, because nothing unholy is becoming to the holy. What is deserving of greater admiration is the fact that she restrained external manifestation of grief to such a degree, although she was deeply affected by the sufferings even of strangers, as never to let a cry of affliction burst forth before the Eucharist, or to let a tear drop from eyes mystically sealed, or let any sign of mourning remain when a festival day came, although many sorrows befell her. For she felt that the soul that loves God should subject all human things to the divine." "Hardy and vigorous and free from disease all her life, she herself was seized with sickness. Of the many ills she suffered, not to prolong my story, nothing affected her so grievously as the inability to eat. Her life was in danger for many days, and no remedy for the disease could be found. How did God sustain her? Not by raining down manna, as of old for Israel, nor by striking the rock that gushed forth water for the thirsting people, nor by feeding her with the help of ravens, as the great Elias, nor by satisfying her need by a prophet carried through the air, as was done for Daniel of old when he suffered hunger in the lions den. In what manner, then? She thought that she saw me, her darling for not even in dreams did she prefer any other of us come up to her suddenly in the night with a basket of purest white bread, and after blessing and signing it with the cross according to my custom, feed and comfort her, and that she then recovered her strength. And this vision of the night was a thing of reality. For from that time she returned to herself and was of better hope. This is evidenced by a clear and manifest token. For on the day after, when I visited her early in the morning, I noticed at once that she was more cheerful. Then I asked her as usual how she had passed the night and whether she required anything. 'You fed me very readily and kindly, my son,' she said, c and now you ask how I am ! I feel splendid, and quite comfortable.' And at the same time her attendants made signs to me not to gainsay her and to accept her answer at once, lest she might be struck by despondency if the truth were revealed." "I was voyaging from Alexandria to Greece over the Parthenian Sea. I sailed at a very unseasonable time, on an Aeginetan ship, impelled as I was by eager desire. What especially influenced me was that I had fallen in with a crew whom I knew well. We had proceeded but a little way when a violent storm arose, and one such as my shipmates said they had seldom experienced before. While all were afraid of a common death, I was in greater fear of spiritual death. Unfortunately, I was in danger of departing from life unbaptized, and I yearned for the spiritual water amid the waters of death. Therefore, I cried aloud and begged and implored a brief space of time. And my shipmates, in spite of their common danger, joined in my cries as not even many relatives would have done, being kindly strangers who had learned sympathy from their perils. Thus did I suffer, and my parents suffered with me, sharing my danger which became known to them in a dream. And they brought help from the land, calming the waves by prayer, as afterwards we learned upon reckoning the time when I returned home. This was also revealed to me in a salutary sleep which I at length experienced when the storm abated a little. I seemed to be holding fast to a Fury of fearful aspect, threatening danger, for the night represented her clearly to me. Another of my fellow voyagers, a boy very well disposed and dear to me and deeply concerned for me, under the circumstances, thought he saw my mother walk upon the sea and seize the ship and with no great effort draw it to land. And this vision was believed, for the sea began to grow calm, and we quickly arrived at Rhodes, without experiencing any great distress in the meantime. As a result of that peril, we ourselves became an offering. We promised ourselves to God if we were saved, and, on being saved, we gave ourselves to Him." "My mother was a worthy companion for such a man [as my father] and her qualities were as great as his. She came from a pious family, but was even more pious than they. Though in her body she was but a woman, in her spirit she was above all men... Her mouth knew nothing but the truth, but in her modesty she was silent about those deeds which brought her glory. She was guided by the fear of God." "Our mother, from the beginning and by virtue of descent, consecrated to God and receiving piety as a necessary heritage not for herself alone, but also for her children, was truly a holy lump from the holy first fruits of the dough. She so far increased and augmented it that some have expressed their belief the assertion is bold, but I will make it that not even her husband's perfection was any other's work than hers. And how wonderful it is that a greater and more perfect piety was bestowed as the reward of piety! Both were lovers of their children and of Christ. Yet it is a striking paradox that they were more devoted lovers of Christ than of their children. Their sole enjoyment in their children was that they be known as Christ's and called His. Their single definition of good children comprised virtue and kinship with the Chief Good. Compassionate and sympathetic, they rescued much treasure from moths and brigands and from the prince of this world, transferring it from their place of exile to their homeland, and storing up the glory of heaven for their children as their greatest inheritance."